Light snow just started here after a bit of virga. Currently 30F, DP 18F. eta: Started with a mix of flake sizes, so it was easier to see, unlike the last couple that started with pixie dust. Virga still in Phoenixville at 9:40. 31F DP 18F. Virga and 32 w/dp 16 here in NW Philly. Light snow in Glen Mills. 31F. Good steady light snow here, 29F. Except for a sunny area of the driveway, things are whitening up! Just measured 0.6" - probably more like moderate snow now. 28F and DP 24F. Just restarted the snow pile, lol (disappeared on Friday). Just looked outside (11pm) and was very surprised to see the ground white! Had to have started just after 10pm. Temp. 34F so we'll see how it goes. Will measure soon. Just measured 1 inch here on my snow board in Chadds Ford, PA.
Just measured 1.1" here...not sure how much more we'll get given the look of the radar to the west, but nice to get to the 1" mark anyway. I think we get to 2 inches. Nice - good thing you stayed up for it! As of midnight 0.6", light snow. 33F. Very nice. Radar has been hammering extreme south jersey for hours i don't understand why there isn't a lot more. I am under a hole with no returns and have a heavy dusting. Does anyone know where the snow/sleet line is? Looking at the correlation coefficient loop on the COD radar it looks roughly 25 miles south of the Mason Dixon line. 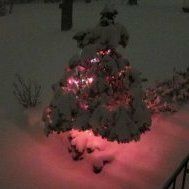 Just measured 1.4 " on my board in Chadds Ford Township, PA.
1.0 inch as of 4:30am, snow has cleared out for now. May be a bit higher, my snow board isnt in the best location right now.